Giro d’ Yosemite is a club sponsored “Fully Supported Tour” for our members. Support includes luggage/equipment transport, meals, accommodations, rest stops and other on route support services. Participating riders only need to train, pay fees to cover expenses, get luggage to start and RIDE. Day one of the Ride starts in the Bay Area and travels to Jamestown on Day One. Highlights are lunch stop in Ripon, and rest stops at a Cheese Factory and Ice Cream Shop. Accommodations and Dinner are provided in Jamestown. Day Two includes Priest Grade climb, lunch at Big Oak Yosemite Entrance, Crane Flat Summit and a breathtaking Ten Mile Descent into Yosemite Valley where libations, dinner and social celebration of your accomplishment await. Day Three gives time to explore Yosemite Valley before returning to the Bay Area. An optional Day Four ride follows the Merced River from Yosemite Valley to Merced Amtrak Station for a Train Ride back to the Bay Area. The Giro d’ Yosemite is brought to you compliments of Leslie Masler (Support Services), Kevin McTighe (Ride Coordination) and is held annually since 1994 during springtime in peak Waterfall Season for Yosemite Valley. For more information contact Veloraptor Kevin McTighe. Below is a map of the route. 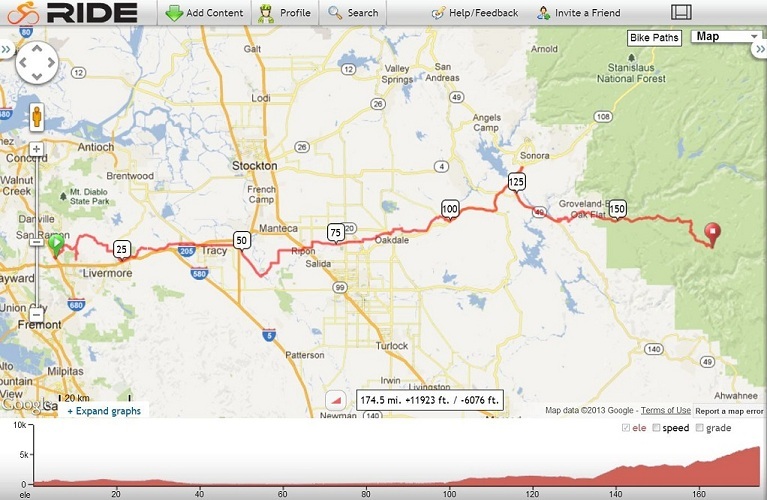 This map stops at Crane Flat, but the ride continues into Yosemite Valley.